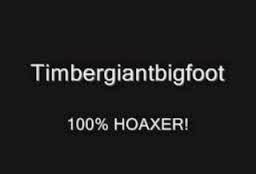 TimberGiantBigfoot - The Owner of the "Wild Dog"
People continue to pick apart TGBF's videos and in this one you can see a jogger that Jim seems to be hiding from. It also sounds like a motorcycle in the background as well.There's a reason he wears crocs Squatching (hoaxing); he never strays far from the road. Just when I thought this video couldn't get any worse, I find yet another red flag. At approximately 13:15 a person can be seen jogging on a nearby trail just before the dog's bark is heard. This mystery jogger in white is most likely the owner of the small dog and is probably the person Timber is trying to hide from. At approximately 1:10 - 1:13 the person in the costume is heard walking behind Jim, yet Jim conveniently ignores the sounds of footsteps and sticks breaking. He seems more concerned about hiding from the dog's owner than filming the alleged Bigfoot.